The Kyocera FS-C5250DN Color Printer is reliable high speed printer to depend upon for your work productivity. This Kyocera printer comes with a standard print resolution of 600 x 600 dpi. Due to its compact size, it is a suitable choice for a space-conscious workplace. FS-C5250DN Color Printer is a perfect and an absolute pick for professional working of medium size workgroups. It gives you cost effective printing with less operations and a speed of 28 ppm. 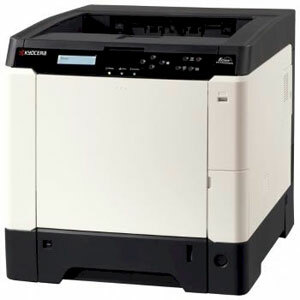 Kyocera C5250DN Color Printer is featured with 667 MHz processor and an upgradable memory of 1280 MB. The printer has a maximum paper input capacity of 500 sheets. Kyocera FS-C5250DN Printer’s warm up time is less than half a minute to give you efficient printing in less time.